In my freshman year in high school I made a very important friendship. Who knows, I might have become the girl content to read Glamour, but he led me down the road of Interview instead. Ross was a sophomore and he hung out in the art room just like I did. The art room was the oasis in a school of 600 kids, most of them football fanatics or of the FFA (Future Farmers of America). But he was sort of like me - except much more advanced. Sure, I knew who Andy Warhol was - but I didn’t know that Andy Warhol was God. And he loved Warhol, Robert Rauschenberg and Jasper Johns. 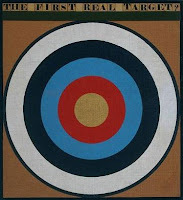 He turned me on to Richard Hamilton and to other British Pop artists like Peter Blake (see his target above). But what was really important was that he turned me on to the early issues of Interview. And I cannot stress enough here that in 1970, it wasn’t like Pop Art was this done deal, this thing which changed forever the course of art. It was sort of there in the rumble of many things. Then again, Interview was not a Pop Art magazine. Interview was a movie magazine. It was about film, about film stars or people who wanted to be film stars. And while it was incredibly current, it gave huge nods to the past. Interview would have pages of Rita Hayworth stamped randomly, repeatedly throughout a magazine. So Interview was also about nostalgia and part of that worldwide craze. The first photomontage I recall making was in my sophomore year – I used Lucille Ball – a 1930s image – when she was not only very beautiful but also considered a new actress, a new Babe - not the comedian she would later be known as, not the genius of television she would also be known as. I think it’s worth mentioning that the first collage I made was of a beautiful woman who was initially, early in her career, first and foremost an object. This friend of mine in high school – we had this ritual we shared with very few people. He used to pick me up – and I lived way out in the middle of nowhere – and take me to the Ashland Police Rifle Range. We went there after dark and pulled down targets that belonged to the police. If they were shot at and full of bullet holes, so much the better. This was this edgy little thing we had, our walk on the wild side down in Southern Oregon. All teenagers have their ventures in which they are bad and steal, but ours was a little unusual. Looking back, it was Romantic too - like a Romantic era in art history, not unconnected to Nostalgia. It was about longing and an ideal, impossible, even violent beauty. In fact it’s maybe more about longing than possession, than the actual having. And this began my fascination for the target. The bullet holes sound sort of interesting.